It’s always a pleasure to make the acquaintance of great artists, especially those with a penchant for penciling not just Marvel & DC characters, but also those from videogames and geek lit. 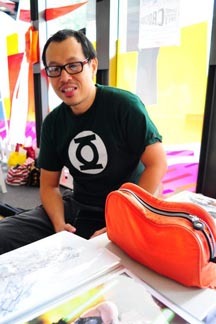 We caught up with Kelvin Chan, the brains behind rocketraygun at Comic Art Show 2011 last weekend, and quizzed him on everything from his start in comic illustration to his plans for the future. He also dispenses some advice for comic book hopefuls. Meet Kelvin Chan, the creator of rocketraygun. Crimson: You’ve been really popular online, and you’ve been drawing for a long time now. When did you get your start in drawing, and what were your greatest influences during that period? Kelvin: The drawing bit, the interest in comics and pop culture? Since I was a kid. My dad gave me a lot of freedom, and he supported me all the way. Star Wars was a very early and great influence, but the first thing I can remember is Tarzan comics in the Sunday edition of the Straits Times. That got me really interested in muscles and the human anatomy. My forte and my real passion is human anatomy. Crimson: Did you ever consider doing comics as a full time job? Kelvin: The thing about comic drawing, it’s never been thought of as something of a profession, so I was more of an illustrator and a designer. My day job now is as an art director for graphics for the press, but with the Internet, the world’s smaller, and then you realize ‘Hey! Everyone’s now got an equal opportunity to break into the industry!’ so on the side, I kept pursuing my art. In ’07, ’08 I decided I was going to try to focus on drawing comics. Crimson: Kelvin, describe your style. Kelvin: I think my style, being an ’80s kid, is influenced a lot by the older, more detailed artists. My main influence or main inspiration is Leinel Yu now. He’s the guy that kind of woke me up and said ‘Hey, wow this is so cool again.’ and got me really into comic art again. In my job as an info-graphics journalist, I have the opportunity to explore all mediums and all styles. In the past few years, I’ve been focusing on realistic digital paintings. Photo-realism. Crimson: What kind of medium do you usually work with? Kelvin: I’ve gone digital for 7 years. My work is mostly digital, except for when I do pencils. I still use pencils, but all my coloring is digital, and if I do my paintings, it’s all purely digital. I use Photoshop. I don’t use Painter. I’m most experienced with Photoshop, and you can achieve the same treatment with the software. You just have to ensure that your resolution is high. Crimson: Do you have any tips for aspiring artists? How can they improve their work? Kelvin: Well, you have to be interested. Always have the passion, draw and draw. Every free moment you have, keep drawing. Develop your own style. But it is okay to emulate the style of your favorite artist. To be the best, you need to learn from the best. Just keep on drawing, and you’ll discover your own style and your own personality will come through. For sequential art… you have to love movies. You have to be able to visualize everything in your mind. Being a comic artist, I’ve learnt that you have to up your game. You need to know backgrounds, perspectives from every angle. The hardest angle is from the chin up. You can’t just draw the same character over and over, face on. You need to know your lighting and shadows, and plot your actions. Many people think that drawing action is good enough, but you must know how to tighten up your shots, plot your story. You’re like the director of your story, so make it as exciting as you can. Watch a lot of movies. Share your work with people and get feedback. Look for criticism. You may not notice it yourself, but with others, the little flaws will come out and if you’re aware of it, then you can put more focus into correcting it. Crimson: And for those who’re looking for their big break? What’s your advice to them? Kelvin: My best advice is ‘Don’t Give Up’. Don’t lose your passion as well. Make the best of it and persevere. Sometimes it’s just about finding the right editor, the right publisher, the right story. Getting that break. Everyone’s got their style. To me there’s no bad artist, just that the style you’ve adopted may not be the current flavor at the moment, so try and try again. Now, if you’re hoping to meet up with Kelvin, he’ll be at STGCC on 20-21 August 2011, where he’ll be holding a signing session for his book – rocketraygun – at the Harris Planerds booth. You can also check out Kelvin’s work at www.rocketraygun.com.